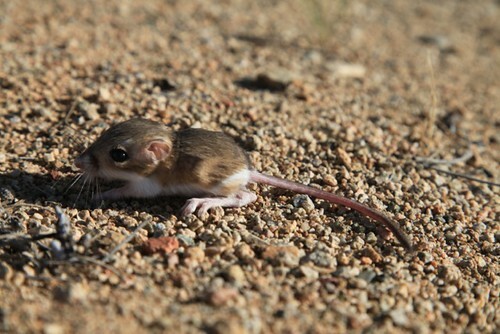 Baby kangaroo rat, a photo by ConserVentures on Flickr. Cuteness for Friday: this little guy was struggling to find the hole he had strayed from (or, with all the rain in the past week, flooded out). We left him where we found him, hoping he'd find his way back before something had him for breakfast. Hummingbird migration begins., a photo by ConserVentures on Flickr. The last week has seen a lot of wildlife drama at Ravenrock. 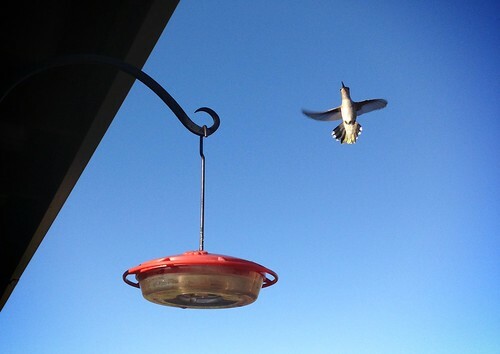 After a summer pretty much devoid of hummingbirds, two took up stations at our three feeders on Monday (a male black-chinned, and an immature Selasphorus—either a rufous or broad-tailed). On Wednesday two more had joined them, and on Friday morning four more, for a total of eight birds doing full-on battle all around the cottage. Most of them are very aggressive Selasphorus, with the black-chinned holding his own. These guys are so pumped up they even dive-bomb hapless butterflies, who get spun around in the hummer-jet-wash.
We put up a fourth feeder, and have gone from a consumption rate of about a cup a week (including Gila woodpeckers and nocturnal nectar-feeding bats) to two cups every 12 hours. 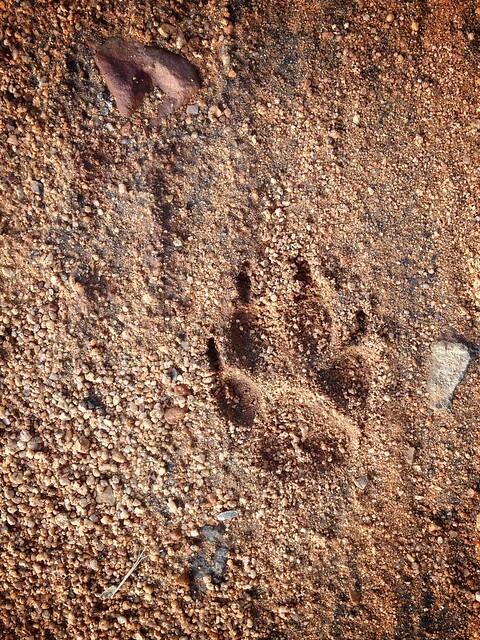 On the mammal front, we had some of the most fun coyote action we've ever had in the area. On our morning walk on Wednesday, just past the driveway on the road to the well, we spied a female white-tail trotting towards us in the desert scrub—her tail flying, and her mouth dripping with saliva. Very odd behavior. She was stopping, listening, and then started snorting the white-tail alarm whistle. Suddenly she bolted up toward the driveway, where we saw first one and then a second coyote. She dove straight at them, and chased one around and around a small tree. The coyotes had enough, and took off to the north. No doubt the young doe had a new fawn nearby, we've seen several already this year. This morning early, while I was out doing some yard work, I heard a coyote yipping off to the west just below our hill, and caught movement down off the state road. Two, then three coyotes were dashing towards the house at full runs—normally they trot-walk. Then two more appeared, and it became clear these five were chasing a sixth coyote, who ran hell-for-leather straight up the hill and bulleted over our hill just behind our bird-feeding yard. The chasers stopped at the bottom of the hill. In the golden early morning light their pelts were gorgeous russet-and-brown, they were very stocky and healthy-looking coyotes. Seems like we've got two packs having a territory dispute perhaps, with our property in the middle of the contested ground. Finally, it's not been quiet on the reptile front, either, though decidedly less dramatic. 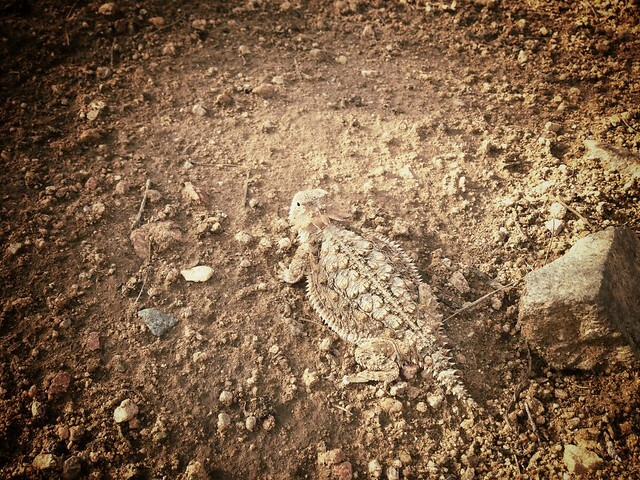 A lovely small desert tortoise kept me company at the clothesline on Wednesday, and also on our walk we passed this lovely horned lizard hunting ants just off the state road. He was so well-camoflaged we nearly stepped on him. In the last week two male northern mockingbirds have set up and are fiercely defending adjoining territories with our home in the middle. Starting at dawn (when this audio was recorded), they have been singing non-stop all day every day, and when the moon was more full, well into the night. We have counted sixteen distinct species (at least) that they are mimicking—greater peewee, lesser nighthawk, American kestrel, Cassin’s kingbird, cactus wren, and Gambel’s quail, to name a few. While we need to confirm it, it seems that they actually do tend to sing time-appropriate songs. 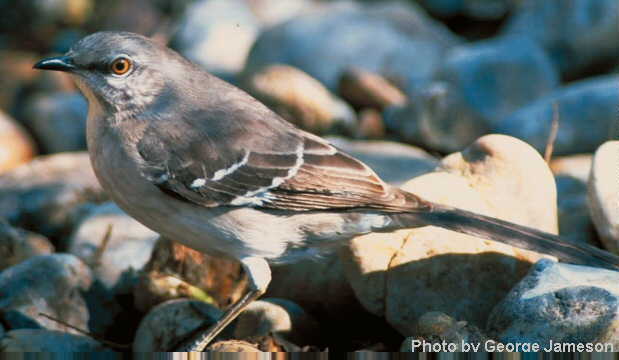 For example, one of them sings Cassin’s kingbird's mostly-dawn and -dusk call right at dawn or dusk. Anyone else notice this same phenomenon? Update on July 21: one of the birds sang most of the night last night, with a near-new moon and cloud cover. 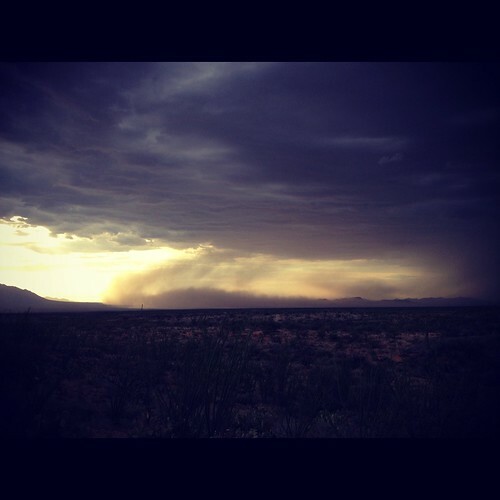 dust_storm_July09_2012, a photo by ConserVentures on Flickr. 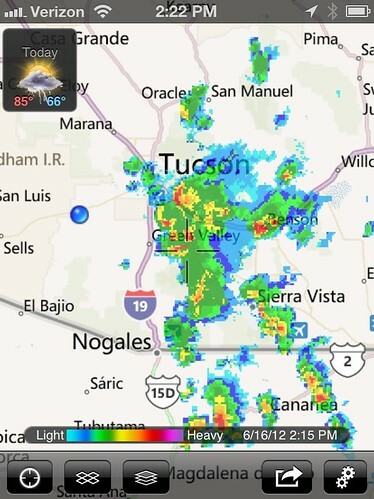 On Sunday we watched a large, fast-moving thunderstorm moving west from Tucson. Its down-draft was impressive, sending a huge wall of dust speeding down the Avra Valley toward King's Anvil Ranch and the Altar Valley. We watched as the wall of dust raced down the valley and enveloped the ranch. Impressive! 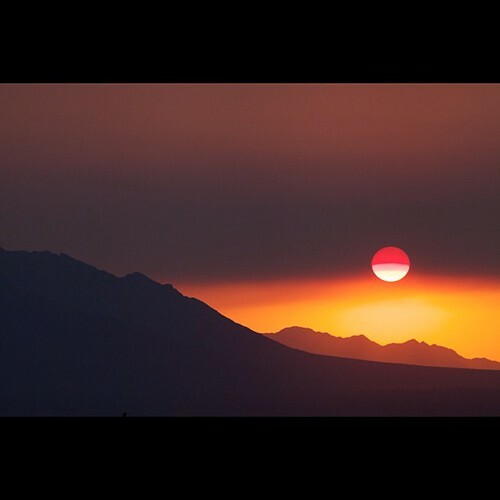 AZ beauty, a photo by ConserVentures on Flickr. Perfect crown of fuchsia flowers on an Arizona pincushion—fazed not a bit by the 100-degree mid-day sun. Hello there. We came home to this pretty guy having a snooze behind the birdseed on the porch. He's in our snake box now, we'll take him a few hundred yards down the hill this evening., a photo by ConserVentures on Flickr. 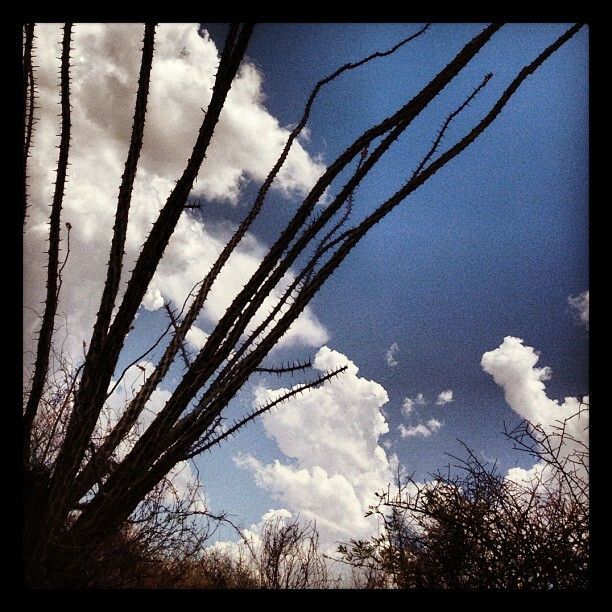 Haven't seen water in the sky here in southern Arizona since September. On our way to LA and forecast is for lots of this stuff. Bring it on! 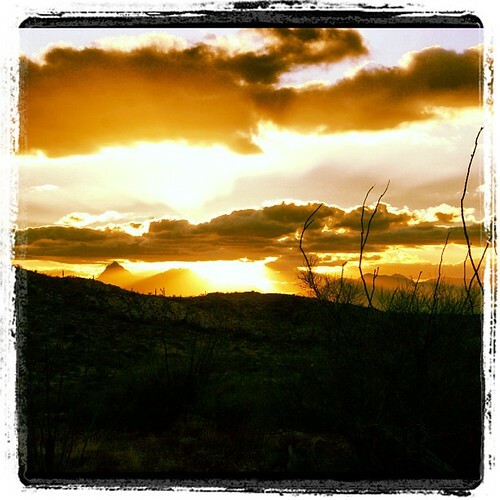 Gorgeous weather in southern Arizona lured Roseann and friend Bruce out for a 100-mile adventure ride - through the grassland hills of the Buenos Aires National Wildlife Refuge to Gadsden Coffee Co in Arivaca. It was so warm we passed a rattlenake sunning on the road. Beautiful end to a lovely day. A lot to be thankful for this week. Anyone else feel fall this morning? 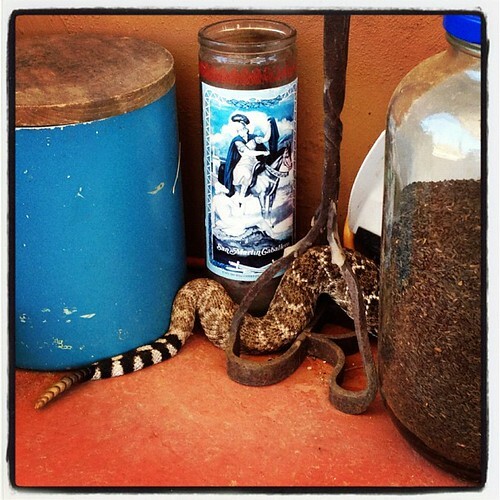 In the desert, it is quiet, sneaky. It was nearly in the 60s this morning ~ cool for us! ~ and the sun is mellow golden, the air crisp, with a hint of something other than the 100+degrees days we've been having. Bird migration is underway, we have vultures gathering in large kettles, and orioles, grosbeaks, and hummingbirds moving through in larger numbers. Woke to thunder and this amazing dawnscape. The hills around Ravenrock are as green as an English garden, with flowers and butterflies everywhere. We leave in a few weeks for East Africa and will land deep in their dry season. But at least the heat is the same! After a rainy night, our local vultures were sunning themselves in the morning sun in trees along the big Raven Wash. I love when they hold their wings out like this - perhaps the only time you could call vultures beautiful! We explored a new route around to the east, and discovered some lovely country and lots of little temporary creeks running from the Sierrita Mountains. 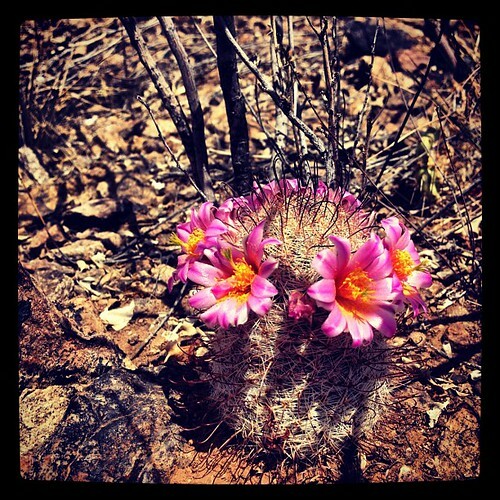 The desert is bursting green, and the sky was lovely blue, the Baboquivari Mountains a vibrant purple-blue. Lots of new flowers and butterflies, including ghost brimstones and bright yellow giant sulphurs. We had lunch at the Gadsden Coffee Company in Arivaca, then out to I-19 via Amado, where we saw this sign—rural church humor. Pretty funny.